In this video, we will discuss, altering a database table column without having the need to drop the table. Let's understand this with an example. We will be using table tblEmployee for this demo. Use the sql script below, to create and populate this table with some sample data. The requirement is to group the salaries by gender. The output should be as shown below. To achieve this we would write a sql query using GROUP BY as shown below. When you execute this query, we will get an error - Operand data type nvarchar is invalid for sum operator. This is because, when we created tblEmployee table, the "Salary" column was created using nvarchar datatype. SQL server Sum() aggregate function can only be applied on numeric columns. So, let's try to modify "Salary" column to use int datatype. Let's do it using the designer. 1. 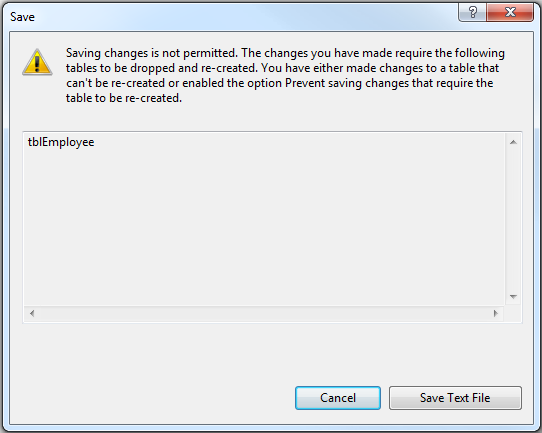 Right click on "tblEmployee" table in "Object Explorer" window, and select "Design"
At this point, you will get an error message - Saving changes is not permitted. The changes you have made require the following tables to be dropped and re-created. 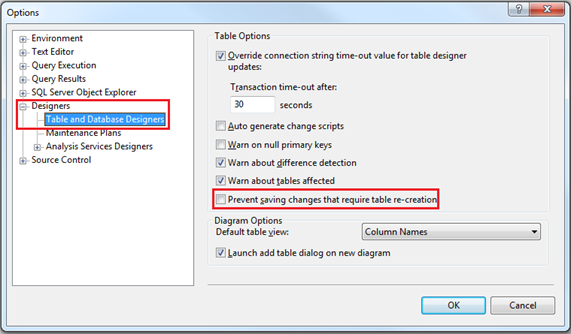 You have either made changes to a table that can't be re-created or enabled the option Prevent saving changes that require the table to be re-created. So, the obvious next question is, how to alter the database table definition without the need to drop, re-create and again populate the table with data? Option 1: Use a sql query to alter the column as shown below. 3. Expand Designers, and select "Table and Database Designers"